Here’s a neat video, I do hope that we’ll start going into space more in the near future. 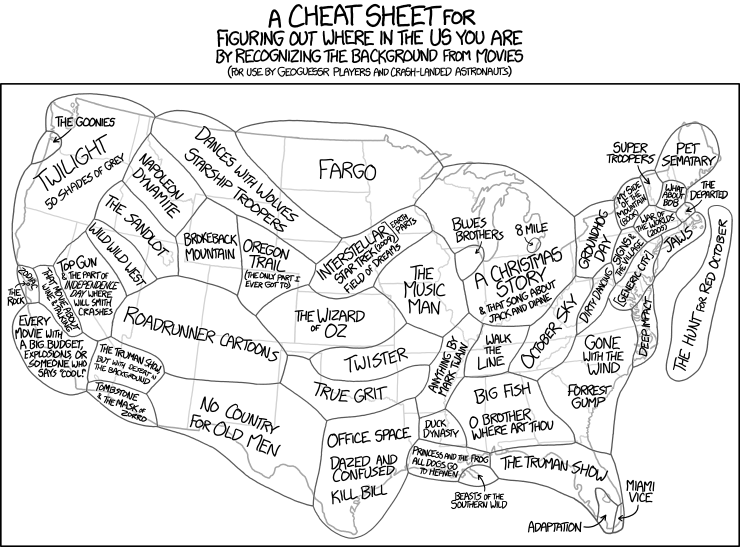 Here’s a handy cheat sheet from the XKCD Webcomic. It looks like I live near the border of Fargo and parts of Intersteller/Star Trek and Field of Dreams. Also some of the locations are from media other than movies, such as the Oregon Trail, or Roadrunner cartoons. Click here to go to the XKCD Webcomic. Click here to go to the large version of the image. This is an interesting video, which goes over ten times that the Simpsons predicted the future. There is some interesting stuff in this video. ORLANDO, Fla. — The employees who kept the data systems humming in the vast Walt Disney fantasy fief did not suspect trouble when they were suddenly summoned to meetings with their boss.While families rode the Seven Dwarfs Mine Train and searched for Nemo on clamobiles in the theme parks, these workers monitored computers in industrial buildings nearby, making sure millions of Walt Disney World ticket sales, store purchases and hotel reservations went through without a hitch. Some were performing so well that they thought they had been called in for bonuses. It’s sad to see how major corporations seem to like to screw over their IT Departments. All to save a bit of money. Not much to say, but I’m working on making new content for the site again. Tomorrow sees one of the most pivotal pieces of internet legislation pass through the halls of power in Washington. The ‘Stop Online Piracy Act’ SOPA bill, combined with PROTECT IP Act, seeks to give the US Justice Department the power to force Internet Providers into blocking access to any website that is suspected of hosting or linking to copyrighted material.Provision for ‘going after’ ‘disputed sites’ hosting companies; search engines that link to them; payment services that support them, and other ancillary services will also be granted through the act. via Tomorrow The Internet Will Begin to Die. Small and large businesses that are based off of the ‘net could just vanish and die, I must say that this cannot happen, if it does, there will be some huge, bad, changes to come. It’s 11/11/11 today! isn’t that neat? Also apparently some groups believe that this date may have something to do with the apoclypse, or some metaphysics stuff… But I just think that it’s a neat date, being able to say that it’s 11/11/11! In the end it’s just our clocks moving forward, and seeing the changes that are happening to the world.